Thu, Mar 22, 2018, 11:47 pm SL Time, ColomboPage News Desk, Sri Lanka. 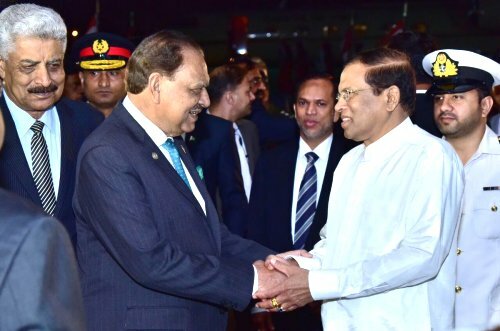 Mar 22, Islamabad: Pakistan President Mamnoon Hussain warmly welcomed his Sri Lankan counterpart President Maithripala Sirisena on arrival at the Nur Khan Air Base in Islamabad this evening (March 22). President Sirisena today commenced a three-day official visit to Pakistan to participate as the Chief Guest in the South Asian nation's National Day celebrations scheduled for tomorrow. He will witness the National Day military parade, air display and pageant. This is the first time a Sri Lankan leader received such an invitation to be the chief guest on the national day of Pakistan and it reflects the strength of bilateral friendship and ties. Pakistan gained independence on August 15, 1947 and became a republic on March 23, 1956. Since then the Republic Day is celebrated as the national day of Pakistan. President Sirisena will also hold discussions with President Mamnoon Hussain and Prime Minister Shahid Khaqan Abbasi tomorrow. The discussions are expected to cover cooperation in economic, trade, investment, management, education and training and education fields between the two countries. Pakistan and Sri Lanka will sign four agreements related to foreign service training, education and tourism during the President�s visit.